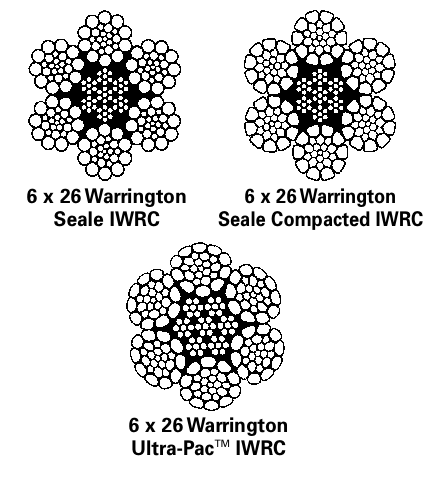 Although compacted strength wire rope is superior to standard wire ropes in many ways, Ultra-PacTM wire ropes take it to the next level. The process consists of taking a larger diameter compacted strand wire rope and running it through a rotary swager to reduce the diameter. Ex: Taking a 1″ 3/32″ and reducing it to 1″. The advantage of this is that the wire rope retains the breaking strength of the larger diameter while becoming more crush resistant and abrasion resistant, still maintaining excellent fatigue resistance. Ultra-PacTM is engineered for overall performance, its wire tensile strength being the key to its superior fatigue resistant properties. 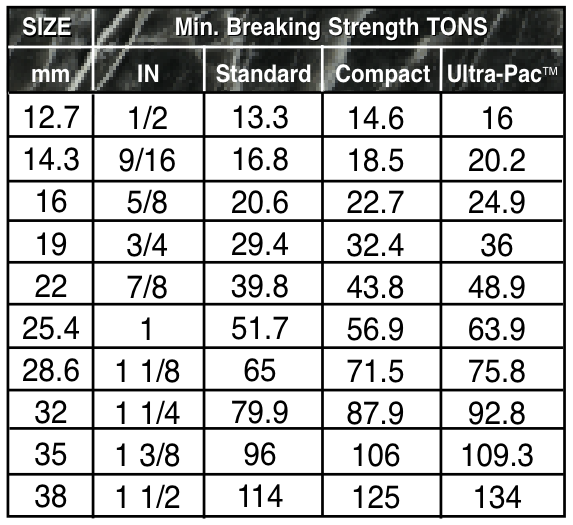 In addition to contributing to Ultra-Pac’sTM breaking strength, the wire used in the manufacture of Ultra-PacTM remains supple, minimizing the occurances of external and internal wire breaks caused by operating stresses. Ultra-PacTM clearly out performs other ropes in service life. Steel wire, by its nature, has limits. When pushed to its extreme in terms of tensile strength, wire becomes brittle and loses its flexibility. 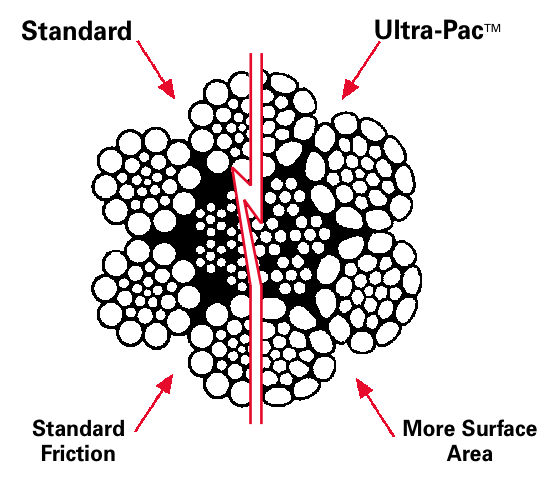 Ultra-Pac’sTM improved fatigue properties are derived from the combination of Ultra-pac’sTM flexible construction and the compacted strands. The compacted strand has very favorable internal contact conditions when compared with the point contact of round wires within a normal strand. These reduce internal friction and nicking for a longer fatigue life.